Bleach safe towels 16X28 weight 3.3Lb at very competitive low price from Towel Super Center. Heavy weight made of 100% supreme cotton super soft various colors available. Popular with Hair salon and Nail salons! Salon towels need to stand up to the toughest jobs. Every day, they encounter chemicals, dyes and bleach-based products. You may feel that you can’t choose colorful towels because of the risk of staining or spotting. However, Towel Super Center offers bleach-safe towels in a variety of hues that will match your business’s décor. 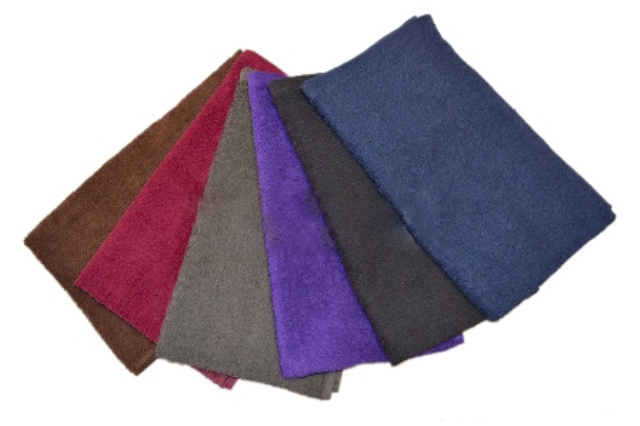 Our 16” by 28” bleach-safe salon towels come in burgundy, black, charcoal, purple, dark brown and two shades of blue. They’re well-crafted and manufactured using 100 percent cotton. So, why invest in towels that will be ruined after just one use? These towels not only look great, but they will work as hard as you do. We are known throughout the web for our amazingly low prices. The best part is our special discounts on wholesale. This is perfect for salons that need a well-stocked supply of bleach-safe towels on hand. Buy in bulk and see your savings grow. Having a well-supplied linen closet filled with bleach-safe towels that you bought wholesale is smart and savvy, so order today. At your salon, bleach and other chemical products are a part of everyday life. These can take the color out of any fabric — and we’re sure you’ve gone through your share of towels. You need a product that can stand up to any job you encounter. That’s why bleach-resistant salon towels are a must. Each of our bleach-safe towels is specially treated to withstand bleach products. That means spotting, splotching and fading will be a thing of the past. Even if you accidentally wash one of your colored bleach-safe towels in an all-white load of wash, it will keep its color. Although there are limits to how much bleach a towel can withstand, our products give you reliability you can trust. Your salon employees will feel at ease, knowing they can use our bleach-resistant towels without the concern of staining or spotting. 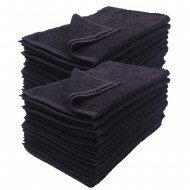 And since these towels can maintain their color, your customers will appreciate that new towel appearance and feel. For the competitive beauty industry, anything that helps you stand out from the crowd is essential. Take your marketing and branding up a notch by adding a logo or monogram to your salon towels. When you place your order for these bleach-safe towels, you can have them shipped to an embroidery shop near you. There, you can have them specially embroidered to add a little extra something to your salon towels. Hand towels are a necessity for every salon. You go through a pile a day at least, and laundry is an everyday necessity. Purchasing our bleach-safe towels means that no matter how much you wash them, what type of hair products they encounter or what kind of detergent you use, they’ll maintain their shape and color. You will save money by not having to buy new towels every few months. We offer incredible discounts to customers who buy in bulk. 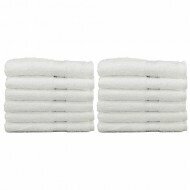 So, whether you need a dozen or 10 dozen, the more you purchase, the less each towel costs. After weeks and weeks of fluffy, soft towels that remain as good as new, you won’t regret stocking up. Take care of all your towel needs at Towel Super Center. We’ve got what you need at the best price out there.